As summer ends and fall begins, it’s the more common time of year for outbreaks of Legionnaires Disease. With 2015 outbreaks in New York, California and the Midwest, more attention is being given to this bacterial disease that has been on the rise in recent years. Left untreated, Legionnaires Disease (a severe form of pneumonia) can be fatal. Hiding beneath the biofilms allows Legionella to grow while protected from many commonly used water disinfectants like chlorine (Cl2) injected from the city. Since biofilm is a breeding ground for Legionella, complete removal and on-going treatment of water systems the only way to eliminate and prevent the deadly bacteria. 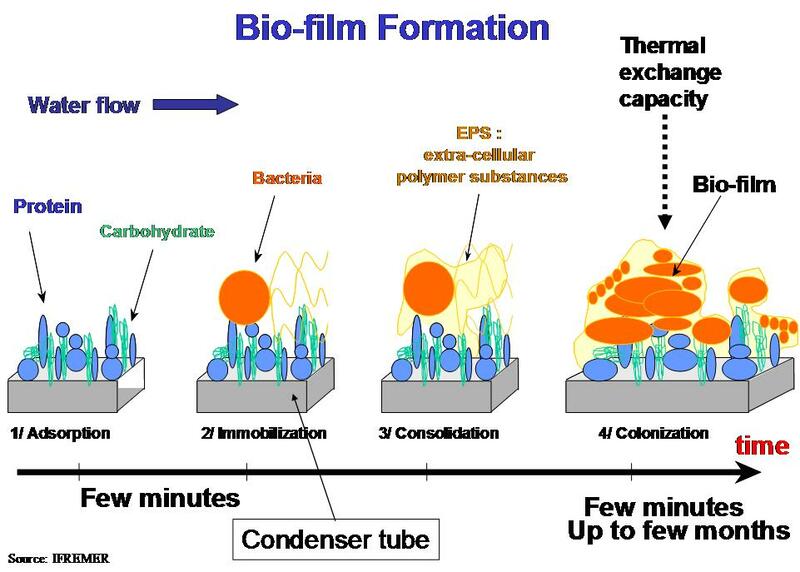 Some common options for biofilm removal and ongoing treatment (secondary disinfection) in water systems include injecting chlorine dioxide (ClO2) or u mixed oxidant solution (MOS) from MIOX. While effective in the treatment of bacteria hiding under biofilm, chlorine dioxide has some challenges. Being hazardous, ClO2 cannot be transported as a gas. The sodium chlorite used to produce chlorine dioxide is expensive and can explode upon impact. MIOX’s MOS, created with the combination of salt, water and electricity, is a much safer and less expensive alternative for biofilm removal and water disinfection. MIOX mixed oxidant solution (chlorine, hydrogen peroxide and a few other trace oxidants) can be freshly and efficiently generated onsite daily with no hazardous chemicals. It is safer, less expensive and more environmentally friendly than most all methods of disinfection. Since it is generated onsite, it is more efficient as it is used as it is produced. It does degrade like bleach that sits on the shelf for weeks or months. With HMIS ratings of Health – 1, Flammability – 0 and Physical Hazard – 0, MIOX is safer than hand sanitizer. MIOX can replace biocides used in your water systems and cooling towers and efficiently kills the bacteria under the biofilm layer. Legionnaires Disease is one of the biggest issues of bacteria in a biofilm layer. Legionnaires Disease was first recognized in Philadelphia in 1976 as being caused by Legionella, a pervasive aquatic organism that thrives in warm temperature environments and is responsible for more than 90% of diagnosed cases. Legionella hides beneath biofilms, the slimy, glue-like substances that form when bacteria adheres to surfaces in watery environments and stick to all types of materials, including metals and plastics. As infected water then circulates during normal process operations, such as in water treatment cooling units, air conditioning cooling towers, fountains, hot tubs and large plumbing systems, biofilm debris is eroded and dispersed throughout the system and aerosolized, increasing the risk of passersby inhaling a sufficient number of the airborne bacteria that cause Legionnaires Disease. This infected aerosol can travel up to seven miles in distance and the CDC (Centers for Disease Control) estimate that over 65% of hospital-acquired infections are caused by these biofilms. Long term Legionella prevention is only possible with biofilm removal, water disinfection and prevention of future biofilm growth. Routine monitoring and testing of samples from multiple susceptible sources can indicate the effectiveness of control measures already in place and provide early warning of potential problems. Over 18,000 people are hospitalized in the U.S. every year due to Legionnaires Disease and with our aging population taking new medications that suppress immune systems, more people are susceptible to infection each year. When Legionella preventive measures are effectively implemented, Legionnaires Disease prevention is possible.